Gary Hume is something rarely encountered in British art: a sensualist. British art is good at producing satirists, fantasists, conceptualists, nature worshippers, animal-lovers, moralists, Luddites and sexual obsessives with a cruel edge — the Spencers, the Gills, the Freuds, the Ovendens. And, judging by the recent spate of artistic ennoblements on the birthday honours list, it has also become particularly good at producing social climbers. But sensualists, no. The problem is, I think, that all the things British art is innately good at involve the maintaining of a distance. ­Satirists mock others. Fantasists go elsewhere. Animal-lovers prefer beasts to humans. Sexual obsessives see their partners as legs of mutton. But sensualists must adore the sensations they are celebrating and give ­themselves up to them. They must relinquish control and embrace abandon. And that is very un-British. However, you can see Hume doing exactly that on the painted doors with which he greets visitors to the frustrating selection of his work that has opened at Tate Britain. I’ll get onto why it is frustrating in a moment. 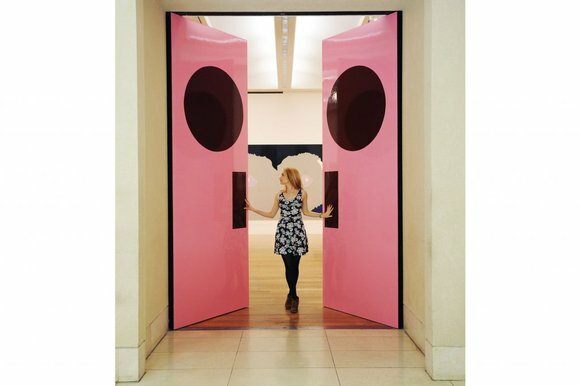 First, we need to enjoy the sensuality of those big pink doors, created specially for this entrance. In a typically playful gesture, Hume has turned them into a face, with the addition of brown windows where the eyes should be, and brown nostrils instead of door plates. So you enter his show as you might a ghost train or a grotto: through a giant face. Finally, though, this is a work about that tasty cupcake pink and its subtle relationship to that deep chocolate brown. The first time I saw Hume’s work, in 1989, he was ­exclusively a painter of doors: real doors, minus the handles, treated as if they were minimalist rectangles, painted in a range of shiny enamel glosses that played with the light and eradicated most of the artist’s touch. There’s not much I can say to you about the beauty of these kinds of enamel surfaces if you have never enjoyed them yourself. But if you have ever looked longingly across a perfectly still lake in the Scottish Highlands, or into the pale blue bonnet of a vintage E-Type, or down into the lovely yellow of a piece of medieval enamel from Limoges, you will know already what Hume was after. It’s that bottomless ­coloured shininess, that sense of colour behaving like a mirror that certain types of paint surface give you. As you approach Hume’s cupcake door, my advice to you is to pause before you enter and to listen out for the whispering of your tongue. Forget the grumbling of your brain: brains don’t understand pink doors. You need to let your tongue do the thinking here. As I said, it’s all very un-British. Since his door phase, Hume has expanded his range enormously, as the Tate Britain sel­ection makes evident. These days, he also paints portraits, flowers, animals, birds and elusive bits of poetic symbolism with impenetrable meanings. The resulting display is frustrating because it is so poorly curated. Having ditched chronology for the dreaded all-at-once thematic approach fav­oured by the Tate, the show fires picture after picture at you, with no pause for sense or encapsulation. Early works hang next to new works; pieces from 2011 stare across at pieces from 1993. A blobby portrait of Angela ­Merkel looks over at a blobby portrait of Tony ­Blackburn. This pointless mixing up ­creates the false impression that Hume’s art has remained stuck in one mode. With no ­tangible journey to follow, you go from mix to mix, room to room, ­dipping in here and there, Tateishly. A less feeble effort of curating would have traced a more meaningful route from the doors to the Tony Blackburns to the garden birds. Hume is a finder of beauty in modest places, a ­celebrator and enlarger of ­ordinary moments. Just as his painted doors endowed everyday domestic effects with the grandeur and seriousness of a $3m piece of American minimalism, so the blackbird he painted chirping on a branch in 1998 has been given the emblematic presence of a coat of arms or a big Moorcroft vase. Enlarged and glorified thus, his simple sights acquire an unexpected poetic heft. Few images in British pop are as intrinsically banal as a portrait of Tony Blackburn. But by reducing the DJ’s outlines to a bare minimum, keeping only the shape of his hair, by inventing a fine colour scheme for him of black, yellow and Band-Aid pink, Hume creates a Blackburn with something of the medieval banner about him: a Blackburn that Henry V might have waved before him at Agincourt. And because it’s Tony Blackburn, a trier, a bumbler, a loser, there is also the added dimension of poignancy you find in most of Hume’s art. His pictures may borrow from the look of coats of arms and Limoges enamels, from medieval banners and Warhol’s pop portraits, but their mood remains Benny Hillish and forlorn. Baby, painted in 1994, shows a scared face with red eyes staring out from the dark like a frightened lemur in a Madagascan jungle. Green Nicola, from 2003, is a portrait of a woman whose hair falls so comprehensively over her head, you only see a sliver of her haunted face. It’s an effect you often find in Hume’s art, of his subjects looking up at you from deep within a colour, like a face staring up from the bottom of a pond. The archetypal such image is a portrait of Kate Moss from 2002, called Beautiful. Moss’s mangled features have been reduced to a flesh-coloured circle with a simplified nose in the middle that belongs to Michael Jackson. At first sight, you have no idea this is a portrait. It looks more like a warning sign. As a pair to the Hume show, Tate Britain has simultaneously opened a look back at the notable career of Patrick Caulfield. A member of the same Royal College generation that gave us David Hockney and Peter Blake, he was a pop-era pioneer of the black outline and the ­simplified shape. His paintings did to 1960s interiors and still lifes what stained-glass ­windows do to religious images: by surrounding them with black outlines, they turn them into emblematic presences. Unlike the Hume, the Caulfield follows a rough chron­ology. We start with his exciting early work, dawdle through his dull middle period and end impressively with a final burst of vigour just before his death in 2005. It makes clearer than I had previously realised how much Caulfield owed to cubism, and particularly the decorative collages of Picasso and Braque in their synthetic cubist phase of the 1910s. The resulting art seems to be about interiors and still lifes, but is actually playing complex perceptual games with the spectator’s eyes. What’s real, what’s painted? Where does the diagram end and the evocation begin? What is a pattern, what is not? It’s clever stuff, but — and this gets us back to Hume — ­curiously lacking in sensuality. By following Braque rather than Picasso, Caulfield privileged the brainy over the beautiful, the complex over the simple. The results are bitty and clever, but they don’t move you. To move you, they need to be dumber and more heroic.